There are so many different contacts available today that the choices can be overwhelming. Please visit one of our convenient locations to find out what option is best for you. We survey your desires before prescribing contacts so you can be sure the optometrists at Master Eye Associates have prescribed what is healthy for your eyes and have prescribed contacts that provide clear, comfortable vision and are convenient and affordable for you. You'll Not Only Look Better... You'll See Better! Conventional soft lenses are also available in many of the categories above. The eye doctors at Master Eye Associates only recommend disposable lenses because of their significant benefits, i.e. better, safer eye health, better vision and better comfort. Additionally, there have been no new conventional wear soft lenses developed in many many years. All new designs, new advancements and technologies that have been developed in the past 10-15 years have all gone into some type of disposable lens. Disposable soft lenses are healthier and safer; they are more convenient and more comfortable and in many cases also provide better vision. 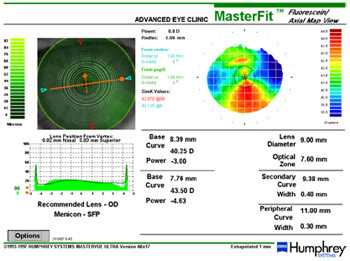 On very hard to fit patients we even use computerized analysis of your corneas for the most precise contact lens design available anywhere!